Did you know that there are nine national park units with the word “canyon” in the name? We have talked about the best known – the Grand Canyon – and also about one of the least well known – Walnut Canyon. 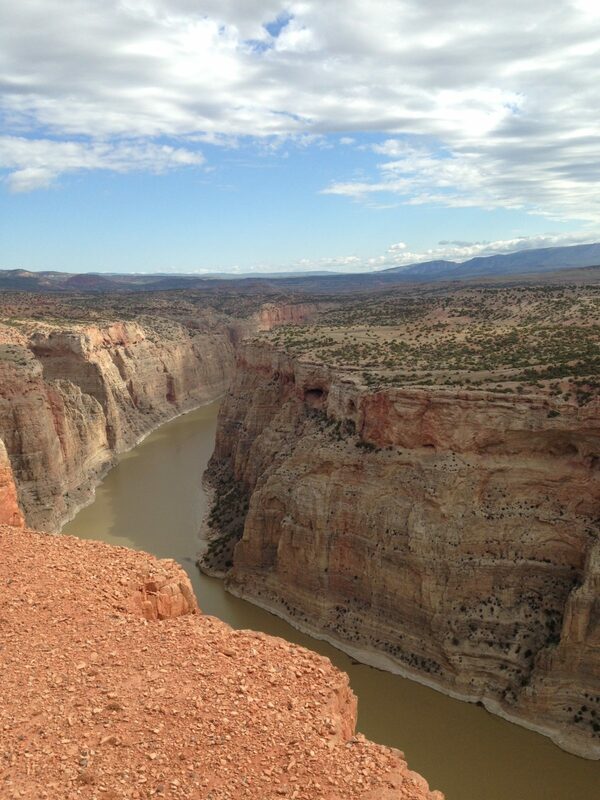 Another of the perhaps lesser-known canyons is Big Horn Canyon – that’s a National Recreation Area. Situated along the northern border of Wyoming, this 120,000 acre Big Horn National Recreation Area extends from Wyoming into Montana. About one third of this acreage is on the Crow Indian Reservation. 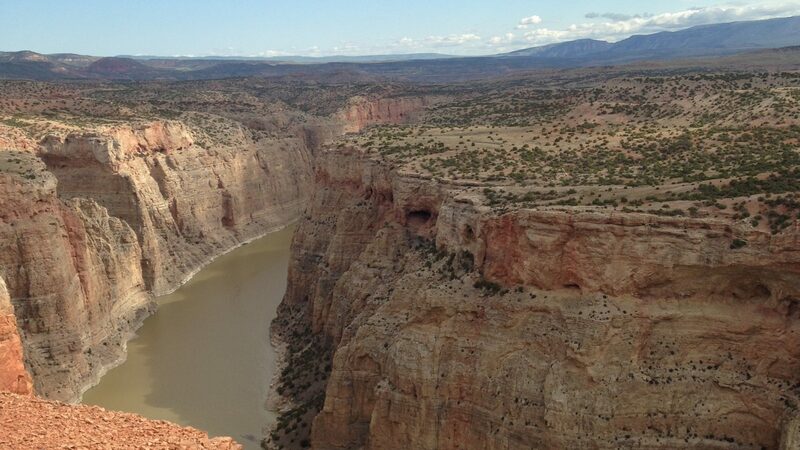 Founded in 1966, Bighorn Canyon National Recreation Area includes most of the 71 mile Bighorn Lake that was created in the mid-60’s when the Bureau of Reclamation built the Yellowtail Dam across the Bighorn River. Along with this amazing lake, the park includes deep canyons, broad valleys, wetlands, prairies, forests and mountains, plus a wide diversity of wildlife including Bighorn sheep, wild horses and the odd bison. We didn’t see any bison, but we saw lots of wild horses right at the entrance to the park. The BLM manages a wild horse range with a herd ranging from 120 to 140 horses. We also spent at least an hour watching some juvenile Bighorn sheep frolicking. They were running along the canyon walls and over rocks like it was flat land. It was a very special experience to see them. Along with wildlife viewing, this recreation area is a fisherman’s paradise. There are several launch locations for boats on the river and on the lake. Most of the people who visit Big Horn National Recreation Area come mainly for the lake. It is gorgeous… you can boat on the lake right up to the canyon walls. 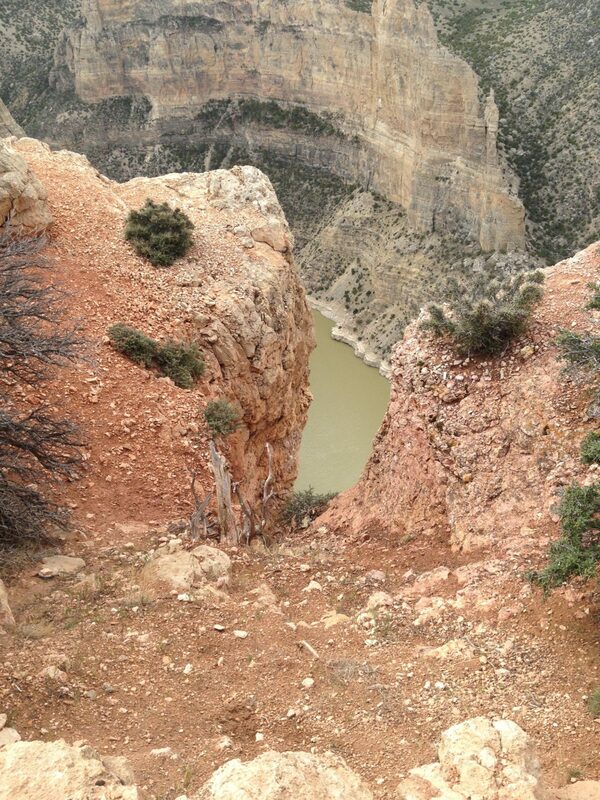 You won’t want to miss Devil Canyon Overlook. That’s where we saw the Bighorn sheep, but even without the sheep it is amazing. The sheer canyon walls fall 1000 feet down to the winding river. We also stopped at Barry’s Landing. 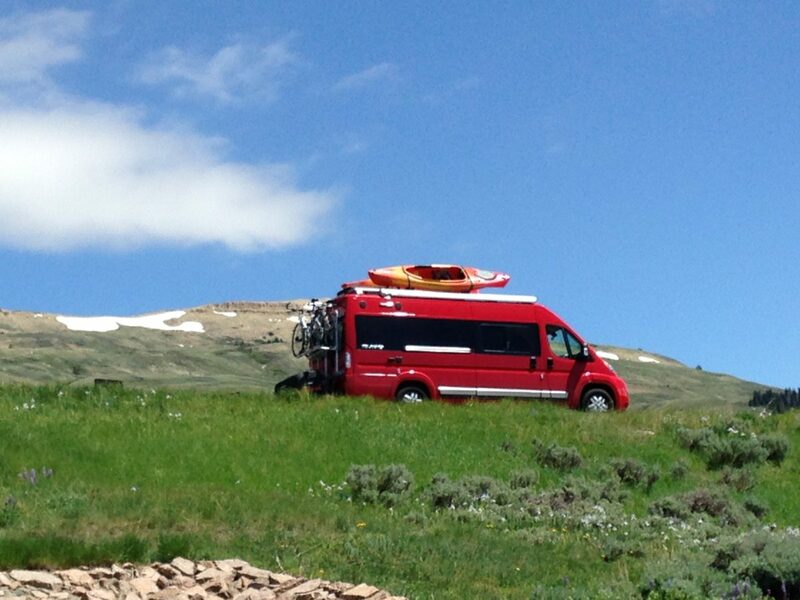 There is cute little campground – with NO services – nestled alongside Bighorn Lake. There is a boat launch there and you can enjoy all types of water sports. It would also be incredibly quiet and peaceful there at night. We didn’t camp there, but we’d love to someday. The park offers 3 campgrounds plus a few boat-in only locations. There are two visitor centers – Yellowtail Dam Visitor Center in Fort Smith, Montana and Cal S. Taggart Bighorn Canyon Visitor Center in Lovell, Wyoming – both open daily. There you can learn more about the dam, as well as the geology and history of the area, including the four ranches that fall within the park’s boundaries. Unique to this park, there is no road connecting the north and the south visitor centers. You have to drive around. We took the 14A scenic drive from Lovell east through the Bighorn National Forest. It was one of the most scenic drives we have been on in all the United States. It was pretty steep and windy (easier on the brakes if you go west to east), but the vista’s were amazing. There are also a lot of Forest Service campgrounds near the top. Visitors can enjoy nature by boating, horseback riding and hiking. There are 17 miles of trails in the recreation area and one quarter of the Pryor Mountains Wild Horse Range lies within the recreation area. The ranger can tell you about specific trails if you go to the visitor center. Here are the nine units in the national park system that have the word “canyon” in the name. Over half of them are designated as National Parks. Which one is next on your list?